Dr Rahemtulla is a Private Consultant Haematologist in London. 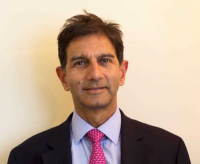 He has over 23 years of experience as a National Health Service (NHS) Consultant. Dr Rahemtulla qualified from University College Hospital Medical School, London and trained in Haematology at the Hammersmith Hospital following which he undertook a period of training in research at the Ontario Cancer Institute, Canada where he obtained his PhD. He then returned to the UK to take up a post as a Wellcome Senior Research Fellow in Clinical Science in the Nuffield Department of Medicine at the John Radcliffe Hospital, University of Oxford before taking up a post as a Consultant in Haematology at Hammersmith Hospital where he spent 16 years.